The wheel hub reduces friction between the fixed wheel axles and the rolling wheels. Wheel hubs run on the wheel axles in roller bearings, which are subjected to a high load as they have to adsorb the entire weight of the vehicle. 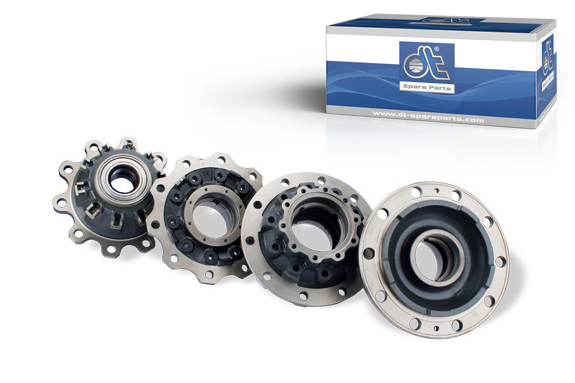 The bearings are lubricated with grease or oil. The front wheel hub is supported on the stub axle, whereby different bearing variants are possible. Adjustment takes place via a castellated nut or via a nut with a lock washer, or a nut with a locking plate and a snap ring. The hubcap and a sealing ring located inside prevent the entry of dust and dirt. The rear wheel hub on the rear drive axle is mounted onto the rear axle housing and the trailing axle and is fixed using tapered roller bearings. The driving force is transferred onto the wheels using the drive shaft via the drive flange screwed onto the hub. Two shaft sea-ling rings installed on the hub housing prevent the entry of dust and dirt. Wheel hubs can be supplied with or without bearings. Only wheel bearings from certified manufacturers are used. Production with extremely narrow tolerances, controlled using state of the art coordinate measuring machines. Monitored quality control of the cast material.